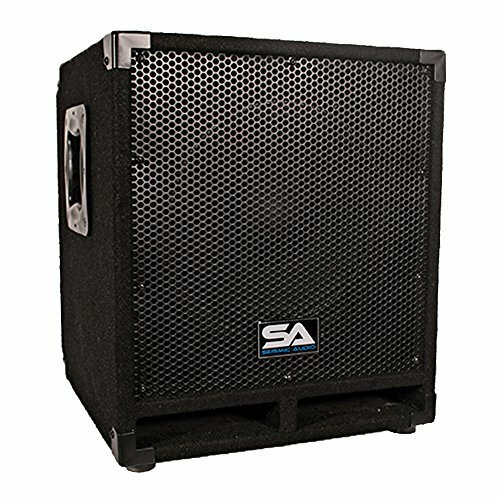 Powered 12" Pro Audio/ DJ Subwoofer Cabinet - Model: Mini-Tremor, Contents: Powered 12" Subwoofer Cabinet, Application: Subwoofer | PA Subwoofer | DJ Subwoofer, Condition: New, Active / Passive: Active (Powered), Connector(s):Two Line Input/output - XLR Combo / Male XLR, LPF (Low Pass Filter):40 Hz - 150 Hz, Volume Controls: Master Volume Control, Power Rating 350 Watts RMS; 700 Watts Peak, Nominal Impedance 8 Ohms, Speaker Size 12", Magnet Size 50 oz., Handle(s):Recessed Pocket, Voice Coil:2" Voice Coil, Frequency Response 45 Hz - 300 Hz, Sensitivity 95 dB, Ports: Yes, Grill: Full Metal Grill, Enclosure:5/8" Plywood Front Panel and MDF, Covering: Black Carpet with Black Metal Corners, Pole Mount: Yes, Amplifier Type: Class AB Amplifier, Height:18.5", Width:15.75", Depth:15.75", Weight 43 lbs. per Cabinet, Warranty: One Year Warranty. Our Tremor line of Pro Audio Subwoofer Cabinets are consistently a best seller and receive high praise for their ground shaking bass performance. After numerous requests for a 12 Inch Subwoofer, we developed the Mini-Tremor. When it comes to power and performance, there is nothing mini about the Mini-Tremor Powered 12" Subwoofer Cabinet! This is a high performance, compact 12" Active subwoofer. The Mini-Tremor was designed with smaller live sound and DJ setting in mind...compact size with deep bass production, this powered 12" subwoofer produces all the deep low end bass you crave!